A flamenco group. Singer sits on hollow box (cajón) which he taps with his hands. Gives quite a good idea of the man's costume. Flamenco is a style of entertainment with song, music and dance. It is very popular in Spain and is known worldwide. Its foundation is in Andalusia in Spain. In its evolution Andalusian Gypsies played an important part. The term 'flamenco' was first recorded in the late 18th century but many believe the art form is much older. Flamenco has acoustic guitar music, singing, hand claps, heel stamps, castanets. It is danced by a man and a woman in traditional Spanish costumes. The dance has no set tempo. It may have both fast and slow passages, rising to a climax near the end. 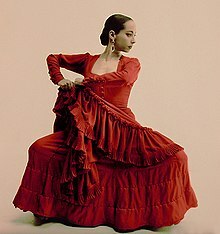 On November 16, 2010, UNESCO declared Flamenco one of the Masterpieces of the Oral and Intangible Heritage of Humanity. Notice the fan, and the heels. This page was last changed on 20 January 2019, at 02:18.